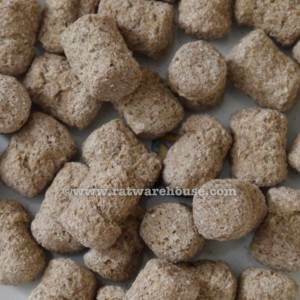 A complete pelleted diet formulated specially for rats and mice, using human food grade soya, providing a consistent source of protein. Relatively low protein levels promote longer lifespan by reducing obesity and other health problems associated with ageing. Formulated for optimum health. Suitable for all rats including those with diabetes and kidney disease. Also suitable for mice and pouchies. Ingredients: Wheat, Barley, Wheatfeed, De-hulled Extracted Toasted Soya, Soya Protein Concentrate, Macro Minerals, Soya Oil, Whey Powder, Amino Acids, Vitamins, Micro Minerals.